Welcome to McMaster Family Farms! 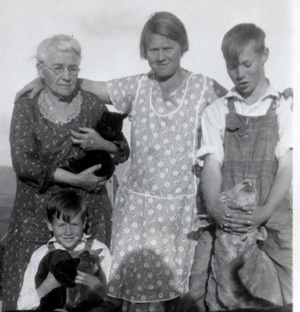 In 1919 William Peters McMaster and Lena McMaster purchased ten acres of bare ground from the Terra Bella Land Company. Prior to this time, Lena had a general store in San Francisco, which had survived the 1906 earthquake. They had two sons, William and Frank McMaster, who were born in San Francisco. To survive, they raised poultry and hogs. William Sr. worked odd jobs, including the installation of pipelines in the Terra Bella Irrigation District. During the Great Depression, William Sr. moved back to San Francisco, where he worked for a country club as a caddy to support his family. They were behind on their property taxes and nearly lost the farm during this period of time. He would eventually return home for good, but died suddenly in 1937. This was an especially difficult time for the family, and both Frank and Bill worked to make ends meet. Frank graduated from Porterville High School in 1939, and attended Porterville Community College, where he studied geology and architecture. He was very fond of both subjects and was hoping to become an architect after graduation. Unfortunately, World War II changed his plans. After World War II, Frank started farming celery with money he received from the Army after he was discharged in 1946. The celery business proved unprofitable, and by 1949 he was broke. It was at this time he met Carl Opitz, who was the Farm Advisor for Tulare County. Carl provided my father with the information he needed to grow his first citrus nursery. 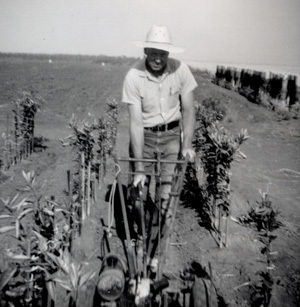 Frank's mother Lena had always wanted an orange grove, so my father started a nursery of Washigton Navels. Carl would become a mentor to Frank, and a lifelong friend. As the first trees in his nursery were ready to be planted, a local grower offered to purchase them. Due to the fact that money was tight due to the loss from the celery farming, Frank sold the first nursery. From this point on he became a full time citrus nursery, providing trees to growers in Central California. It was during these years he also began experimenting with new citrus varieties. He quickly became friends with two researchers at the University of California Riverside, Dr. Robert Soost and James Cameron. They were responsible for developing many specialty varieties as well as cleaning up and distributing older varieties of citrus for commercial application. Through this partnership, my father was able to test many specialty varieties of citrus. He was the first to plant Pummelos in the Central Valley for commercial use, and tested many mandarin varieties as well as pummelo hybrids, two of which became the Oro Blanco and Melogold. He enlisted in the Army Air Corps in 1941. He wanted to become a pilot, but his poor vision put an end to that, so he decided to work as an aviation sheet metal fabricator. 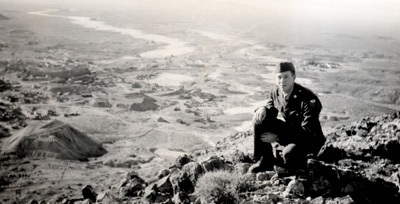 During his Army career, Frank spent most of his time in Tonopah, Nevada, repairing B-24 Liberators that were used for high altitude bomber training. 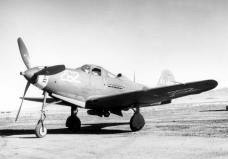 Prior to the B-24's, Tonopah was home to Bell P-39 Airacobras. Frank became a skilled sheet metal mechanic and used those skills throughout his life. 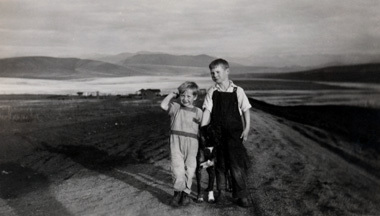 Frank and Bill McMaster standing in the middle of what is now Avenue 80, looking East towards the mountains. 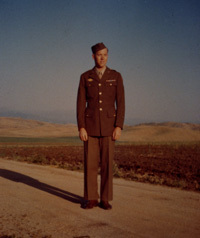 Frank standing on Avenue 80 in 1946 after being discharged from the Army. 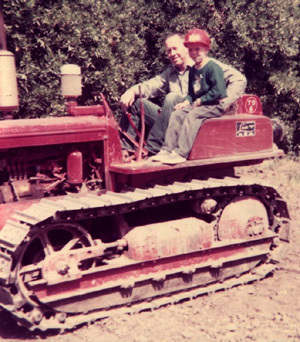 ABOVE: Frank with his first tractor, originally used in his celery farming. International TD-6 used for many years to disc and level the groves. This tractor was also utilized to pull a sled that transported "smudge pots" out to the grove during cold weather to protect the trees from frost. 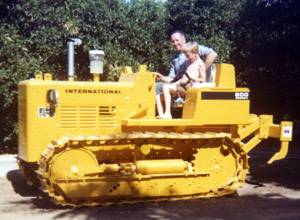 The TD-6 was replaced in 1976 by an International Crawler 500-E, which is still in operation today.